1. Unicorn Drink Floats: these cuties are great for a pool party and to use all summer long! They're definitely one of my favorite pool floats for summer; who wouldn't want their drink to float around like this?! 3. QUAY Sunnies: after the Prime Day discount, these come to around $42! Such a steal and they've been trending like crazy lately - this pink shade is gorgeous! 4. Amazon Echo Dot: this is by far one of the best deals going on! The Dot is the smaller version of the Amazon Echo and it fits in any space, doesn't take up too much room and it looks pretty cool too. It lets you do so much - ask the weather, play music, bring up a recipe, trivial questions and more. It's on sale for $35 but they're selling like crazy! 5. Embroidered Dress: this is one of those wear ALL summer long dresses! The color and embroidery are so pretty and it's such a great length and flattering style for everyone. 8. Cognac Tote: this Rebecca Minkoff tote is on major sale and it's SO big and fits so much! I couldn't believe it when I read the dimensions. It'd be great to travel with and use as your personal item - does anyone else find the biggest bag they own for their personal item when flying?! I mean you have to fit as much as possible right?! It's even perfect to double as a laptop bag. 9. Tripod: this is the tripod I use to take my own pictures, and to steady my camera if I'm taking things like firework pictures. 11. Stud Earrings: during the summer on pool and beach trips especially, I don't like the wear my "real" jewelry, unless I'm going somewhere fancy or special. There's just too many times and places that you can lose your jewelry, like in the sand or ocean (RIP to the many earring backs I've lost). But on the other hand, I hate not having earrings in my ears. I always like to have a few pairs of inexpensive jewelry pieces that are still classy and pretty to wear during the summer, and these are $22! They're delicate but make a statement and at that price, you don't have to wear them and worry. 12. LED Makeup Mirror: this is a game changing mirror! The LED lights are so bright and great for getting ready at your vanity or in your bathroom. It'd make for a really fun gift too! 13. FitBit Blaze: the Blaze is one of the better FitBit's in my opinion, and I can't believe the sale price - and in so many colors! Using a FitBit has helped my sleep schedule so much, plus it's so fun to track your steps each day (and even compete with friends and family!). Prime Day is the perfect time to buy one! 14. Universal Macro Ring Light: this ring light is AMAZING. It's one of my blog photography must haves - it works for any camera, and it helps diffuse the light it gives off so if you have to shoot at night, it's no problem! I love this ring light and it's so affordable - definitely a must have for blog photos. 15. Cropped Jeans: one of my favorite brands of jeans ever, hands down. Their jeans fit like a glove and picking them up during a sale is the way to go! Love that ringlight! My husband was super excited about prime day. Eek I've already spent enough! But now I want some new sunnies! I may need to snag that dress, it's darling! I'm going to be checking out all the Prime deals when I get to my desk later today. I was actually looking at the flamingo version of the pool floats, and they are actually even a few dollars cheaper! OOh I need to look into that ring light! I have been wanting one! Thanks for putting this all together, that tote bag is to die for and I'm headed over to check it out right now!! even though I don't plan on buying anything, I'm having fun browsing all the Prime Day deals! Those are some great deals! I got some storage/organizing things along with some weights and weighted bands to workout with! These are some great picks! I'm currently going back and forth between working, and browsing Amazon. It's so fun! These are great for Amazon prime day, had to purchase the unicorn floaties for my girlfiend haha so good! These are such great deals! I especially love the Kate Spade slides. the echo dot is a steal! I got a new SD card for cheap! Those are some great picks. I bought a few essentials from Prime day. So excited. I need that ring light! I didn't know those existed! Thanks for the ideas. You made a great list! I need that ring light! Those unicorn drink floats are absolutely adorable! The unicorn drink floats are so cute! I have a flamingo one and I love it! Love this day! So fun looking at all the deals! I love all of your choices! The Echo deal has been SO huge for so many people! I also want that LED mirror! It's so good! Thanks for #14, I didn't know this even existed! I had to have restraint during this sale lol. I want everything! Omg I love the unicorn drink floats and the lED makeup mirror! Love your picks! I picked up so many goodies for Prime Day haha - including the Dot. I even picked up some photography stuff too! 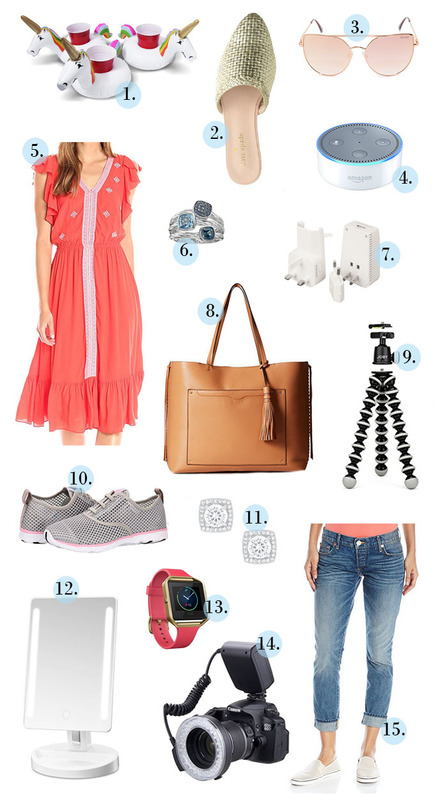 What a great round up of Prime Day deals!! I picked up a few things for myself!! I so need that ring light! Gotta love Amazon!